Mk 4 and CXU-3 Cartridge Installation Install signal cartridge in spotting charge adapter as follows: 1. Insert inertia sleeve into cavity body. 2. Slide cartridge through inertia sleeve with cartridge rim against forward end of sleeve. 3. Press blocking pin inward until safety pin presses through the second guide hole, locking blocking pin in place. 4. Insert cotter pin through outer set of holes in head of safety pin and safety pin sleeve. Bend leg of cotter pin slightly to hold in place. 5. Place compression safety spring over firing pin head into adapter body and hand tighten. Mk 89 Spotting Charge Installation Install Mk 89 spotting charge adapter with signal cartridge as follows: 1. Verify bomb tail well is clean. 2. Insert adapter in the same manner as electric fuzes. 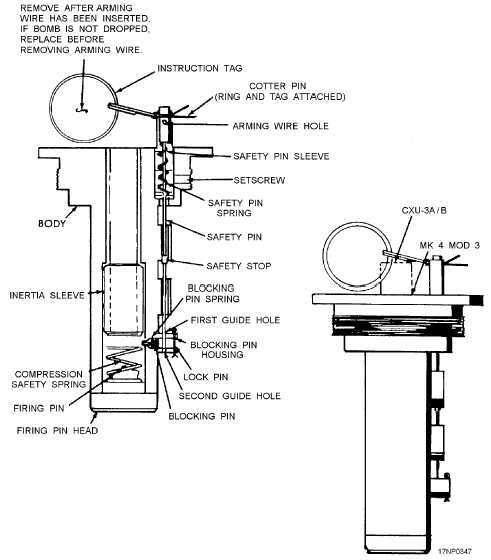 NOTE: The procedures for inspection and installation of nose fuzes and bomb fins are the same as those discussed previously in this chapter for GP bombs. PAVEWAY II, GUIDED-BOMB UNIT (GBU) ASSEMBLY Paveway II GBUs are Mk 80/BLU-110/111 Series GP Bombs with physical characteristics of GBU-12, 13-15 Figure 13-15.Mk 89 Mod 0 bomb spotting charge adapter.